The Twin Sharp made our top ten table, (the only manual sharpener on the list) due to the fact it is very simple to use and is very affordable. 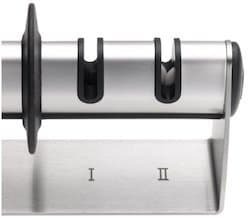 What makes the Twin Sharp almost fool proof is the fact that although the user operates the tool manually, the angles of the modules are pre-set, making it more or less impossible to sharpen a knife incorrectly. (Unlike sharpening steels that do take some practice). The knife sharpener has two separate sharpening modules. 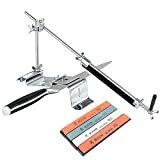 Module 1 contains steel sharpening wheels and is used to for course sharpening and pre sharpening. This process removes small damages to the edge of the blade. Module 2 contains ceramic wheels and is used for fine sharpening and smoothing. In short, the module refines the edge in order to restore the knife to high sharpness. A real plus point is that the Twin Sharp is designed to be suitable for both left- and right-hand operation. Although the Twin Sharp is very simple to use, we recommend that anyone purchasing it, read the manual carefully. This is because you do need to be careful regarding the types of knives you sharpen. 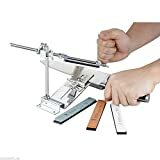 On the more positive side, the tool does not require oil or water to lubricate the sharpening process. It is also relatively easy to clean. In our tests the results were very good, on a very dull knife we still only had to pull the blade through the Twin Sharp 3 passes to restore the edge. The refinement module created a lovely finish with little effort. And with the pre-set angle on each, there was no concern on whether we were taking too much. We tested the finished result on a tomato and the blade sliced through with no issue at all, (prior to sharpening the knife was borderline unusable). It is in our top ten list for good reason. Affordable, great performance and easy to use. 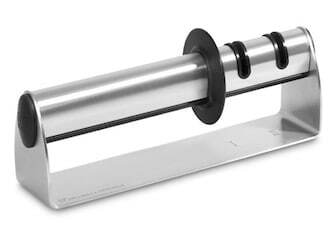 If you are after a manual knife sharpener, the Twin Sharp Duo will definitely do the trick. However, bare in mind that it is only good for household kitchen knives. If you are discerning knife owner with various types, this may not be the sharpener for you. Also, the fact that there are highly recommended electric sharpeners out there that cost only a fraction more, means many do opt for the automated option.